However, as part of the open discussion at our Geohistory/Géohistoire project meeting in August of 2016, our collaborator Robert Sweeny expressed his disappointment (if I may paraphrase) at what might be called the failed promise of online mapping. Interactive mapping and GIS tools should not limit users to viewing pre-digested results of research, much as printed maps were able to do. These tools should allow active exploration of historical GIS-enabled data, including posing new or unanticipated questions, drawing out new or unanticipated spatial relationships – in short, allow the user to use GIS tools to explore and analyse data, in an online environment. Many voices rose from the audience to assure Robert that online GIS applications and tools were under development at that time, and would soon enable the kinds of inquiry that he envisaged and expected. And truly, these tools have been emerging in the last year or two, both in the Open Source community and in the ArcGIS Online world. Robert may have been somewhat skeptical, but he remained ready to be convinced. And so when looking for pilot web mapping projects for our partnership in late 2016, we approached him with a question: would he come up with a scenario for proving the case that online GIS tools had come of age? That what students in his classroom had always needed full GIS software programs to achieve, could now be completed using a web browser? The “other variables” Robert’s scenario is most concerned with are Occupational. He outlined a method using QGIS for drawing connecting lines between the work locations for Market vendors, and their residential locations (as well as these could be determined.) He then suggested different occupation types might have different residential patterns relative to the market work locations. Or perhaps different markets would exhibit more local or more far-flung connections to vendors’ homes. Identifying these locations and drawing the connecting lines between them opens up a wealth of analytical possibilities. So this is what we attempted to do, first using the Open Source Carto tools, and then using ArcGIS Online. The resultant web maps illustration vendors’ work and home sites look remarkably similar (as one would hope!) Quick default views of these are pictured below: the Carto map showing all of the occupational categories, the ArcGIS Online map showing the symbols and lines just for “Butchers” in the markets. A side note: Unlike our other pilot projects, which focus on functionality and customization of coding for map design and presentation, this project is primarily about enabling the user to analyse and explore data interactively. Therefore rather than a breakdown of the code required to produce a final web-map, our detailed documentation consists of the step by step process for using the latest online tools from Carto.com and ArcGIS Online (as of mid-2017) to achieve the objectives of the exercise. There are similarities, and there are differences, in how the two toolsets approach the tasks at hand, and the final products are certainly distinct. More similarities than differences exist though – which often prompts an intriguing conversation many of in online mapping have had: who’s following whom? No space to explore that question here, but feel free to post your own comments below. Some of the similarities are superficial. For instance, the tools to achieve these products are fairly recent additions to their online toolboxes. Both software suites number these among what they both call “Analysis” tools. Their menu-driven editing interfaces look similar, as pictured below. 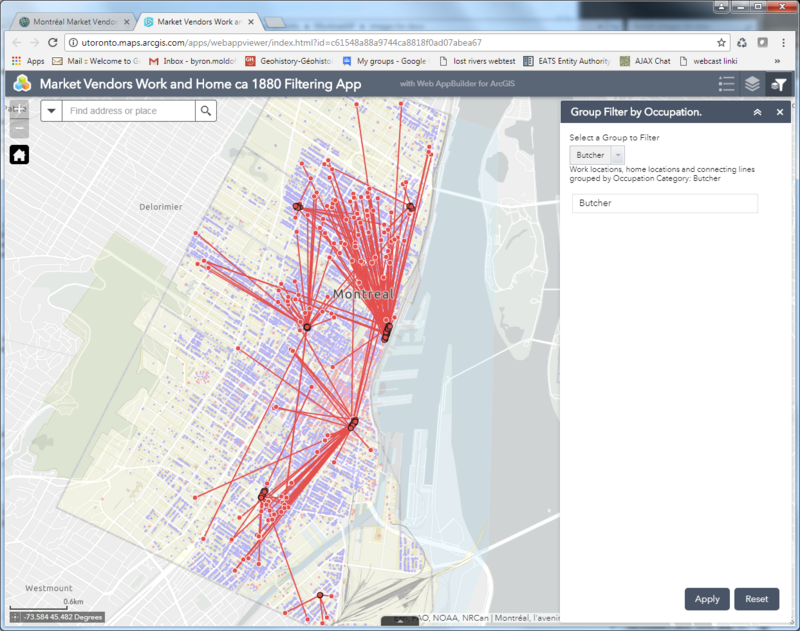 Carto uses an Carto Builder “Analysis” tool called “Connect with Lines”, to create connections between point locations. ArcGIS Online uses an “Analysis” tool named “Connect Origins and Destinations”, to achieve a similar outcome. However, the AGOL tool is actually built to do network analysis and routing, and has much more sophisticated potential applications, whereas the Carto tool is limited to making straight line connections between points. So in order to make the AGOL Origin-Destination tool work for our purposes, some significant data manipulation had to be completed – this is all described in the detailed documentation for those who are interested. This is NOT to say that obliviousness to data discrepancies is always a virtue – trouble-shooting the data issues for the AGOL tool provided a much better understanding of which work points were actually connecting to which home points. Rather, it is just to say that, as usual, one must make sure that for any analytical task, the right tool for the job is identified and used. 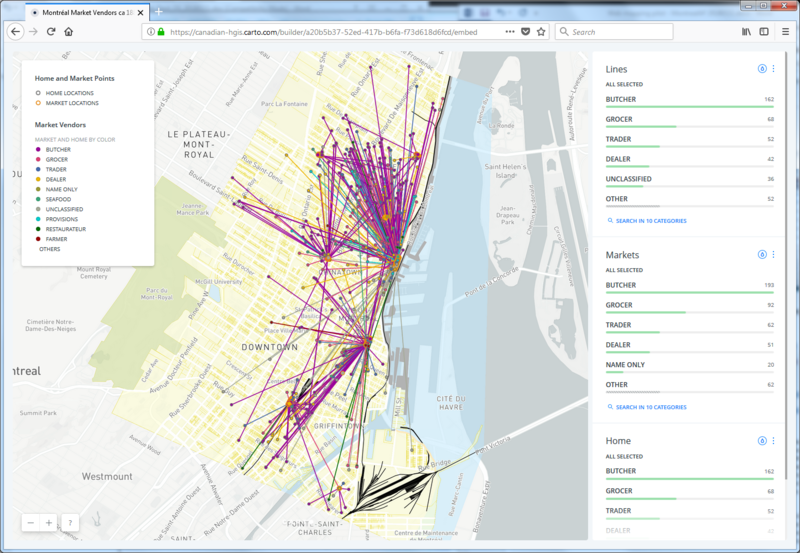 In my estimation, both AGOL and Carto now provide the interactive online tools to map the data, and to allow the analysis for at least this specific scenario, that Robert Sweeny had desired for his students and other users of the Montréal, l’avenir du passé project data. However the question remains: is this an effective environment for doing this kind of work? GIS and other software providers are putting more and more functionality into browser-based “software as a service”, delivered online. The advantages are clear: any browsing device can access these GIS tools, nothing has to be installed locally, resulting in much broader access for users. The disadvantages: limitations in processing tools, limitations in interface and symbol design, and limitations in number of views allowed without paying fees. The question of what is best for any set of students or other users, requires a balancing of these issues. Please feel free to post comments discussing these pilot projects using the space below. For more detailed information about the work done on these pilot project web maps, we have mounted our technical development documents on this site, linked below. The Lost Rivers Walks project (http://lostrivers.ca/) takes people on guided walking tours around the city of Toronto “…to create an appreciation of the city’s intimate connection to its water systems by tracing the courses of forgotten streams, by learning about our natural and built heritage and by sharing this information with others.” They are one of the community partners of Geohistory-Géohistoire Canada. For many years they have been using historical cartographic and other archival sources, interviews with long-time residents, and on-the-ground encounters with the topographic peculiarities of the city to draw the map of Toronto’s drainage pattern as it must have been before the city-building process forced much of it underground. 1. Disappearing Rivers of Toronto: A map of the city of Toronto showing the original stream network of the city, and how those streams disappeared over time as they were buried for purposes of development. 2. Lost Rivers Ashbridge’s Bay Area Walks: A series of interactive maps dynamically illustrating the stops along the way for three of the walks offered by Lost Rivers in this area of Toronto’s eastern waterfront, linking the locations of the stops, and pictures and text related to each, in a “map tour” format. Links to all of the maps are embedded below. This version of the app was built using ArcGIS Online Web AppBuilder, which is a very user-friendly tool which allows authors of web maps to drag and drop user interface components like this standard “Time Slider” widget into their web app. The widget can even be configured specifically for one’s map and data, in limited ways, such as the icon that is used for the tool, and whether the time-specific layers are indicated above it. However, more sophisticated customizations which may be desired, or even necessary, are not possible. For example, the slider has two “handles”, set at 1830 and 1840 in the picture above. Each one can slide forward or backward along the timeline independently, to select a “range” of data. This design is very appropriate for some applications – however when the goal is to illustrate a “snapshot” of the environment at a single point in time – like our “Disappearing Rivers” map – it can be confusing, and the resulting map may be unclear. A slider design offering only one handle to the user, identifying a single point in time, like the picture below, simplifies and clarifies the interface. This customization was only made possible by hosting the app on an independent server (i.e. 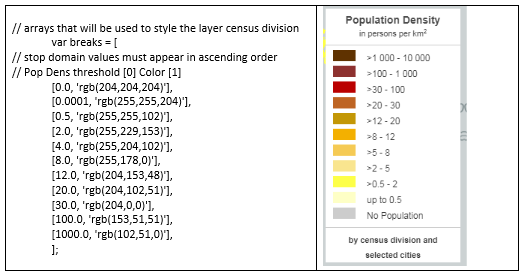 not on ArcGIS online itself, or the Geohistory Portal) and using the Developer Edition of the Web AppBuilder for ArcGIS (https://developers.arcgis.com/web-appbuilder/). This is a rather complicated process requiring the installation of the development app on a local computer, registration of the app on the Geohistory Portal so that portal-based web maps may be incorporated, development and testing of the app and customizations on the local computer, deploying the app on the independent server, and then registering the final app on the Geohistory Portal so that it is accessible there. The disadvantage of working in the simpler generic environment is a reduction in functionality, what could be termed the native intelligence of the application. In this context, using GeoJSON for the Rivers overlay there is no concept of “time-aware” data. The line data is displayed based on a simple query of the integer field value, in this case the “Year last seen on map”. This worked fine for our year-based attribute data, but any more sophisticated queries based on chronology, or using a variety of time formats, could be very problematic to code, or at least more complicated to integrate into the interface. There is not enough space here to go into the production of the Lost Rivers Ashbridge’s Bay Area Walks web maps, but a similar process occurred regarding ArcGIS Online and parallel Open Source development. For more detailed information about the work done on these pilot project web maps, we have mounted technical development documents on this site, linked below. Also, for the Open Source coding we have posted the code used and some examples on GitHub. For further questions about the projects, please feel free to post comments and discussion below, or to contact the author at byron.moldofsky@gmail.com. Our colleagues and friends at NICHE (Network in Canadian History & Environment) and The Otter/La Loutre have just published an interesting article on an Historical GIS project based at the University of Alberta. They have generously offered it for cross-posting here. The project’s partners share many of the same goals as our Geohistory/Géohistoire efforts, and we hope to work with them closely in the future. Demonstrating one of the capacities of our digital atlas, this clip integrates an 1882 Map of Edmonton as a tile layer with varying opacity over the current (2017) OpenStreetMap data. The annotated regions highlight 1882 state-sanctioned land ownership and are displayed in juxtaposition to the current land usage. All materials are in the public domain. Last June at our mid-term conference we presented preliminary results from our research on Geovisualization methods for Historical GIS in Canada. That presentation along with a number of the others presented that day are available on this website, via the program document with embedded links AVAILABLE HERE (Scroll down to Whitepaper update: HGIS Geovisualization (Byron Moldofsky)). Since that time we have been working on revisions to the paper reviewing that research – and we also decided to change the titling of it from “White paper” to “Working paper” – reflecting the exploratory character of some of the research and the speculative nature of its results. The full “Working paper” is now available AT THIS LINK. The paper may appear discouragingly long, but please do not be put off – about two thirds of the text is a reproduction of the online questionnaire we administered (Appendix 3: Canadian Historical Web-mapping User Needs Survey) and detailed reporting of some of the results of that survey (Part 4. 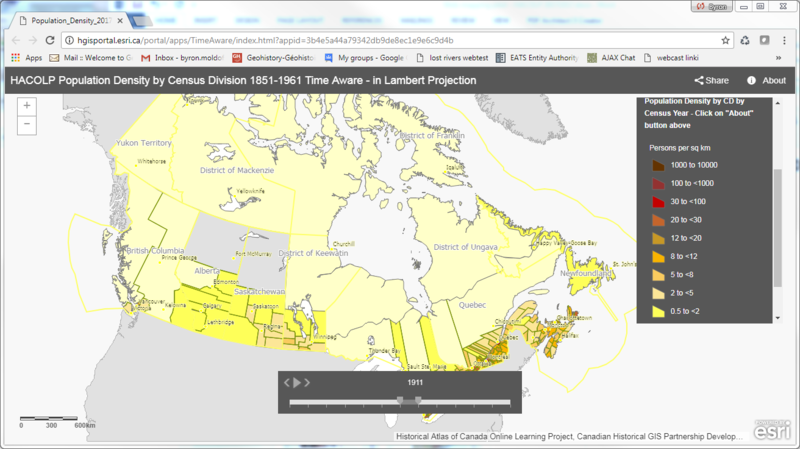 Results of Canadian Historical Web-mapping User Needs Survey.) Many of you went online to take this survey – so you may be interested in what your peers have had to say, in the aggregate (see chart above, for example), and in selected comments. Thank you again for sharing your experiences and thoughts. These principles are my interpretation of the responses to the User Needs Survey, and the discussion among the project members at meetings including the mid-term meeting last June. I would very much like to gather reaction from potential users and collaborators – so you are invited to respond by email or in the Comments section below this post. These three approaches are laid out in some detail in the concluding section of the working paper (Part 5, pp. 45-48), with tangible results proposed for each. If you have time, please take a look at this final section which outlines these pilot project activities, and suggests sample data sets, and let me know if you have any concerns or suggestions, either in the Comments section below, on the email listserv discussion thread or by personal email. As we all know, such activities can consume large amounts of time and resources. We have reached consensus that the priority on the web-mapping side should be 3. Comparative examples of web-mapping approaches, while not completely neglecting the other two activities. Over the remaining months of the project we will work to create sample projects online for several of the data sets suggested within the paper. We have already started on these, and enlisted some of our partners and collaborators for data and technical assistance. We will try to provide one or two progress reports via these News and Notes posts, as soon as we have some neat web-mapping to show you! On June 20 we hosted the project’s mid-term Conference, at about the half-way point of our 2-year mandate. Interested folks from around the country were invited to attend in person at the University of Toronto, or tune in online to our video webcast. The conference program, with embedded links to many of the speakers’ presentations, can be found here. Project collaborators reported on progress made to date on the planned white papers, and on how we have been advancing the project’s goals. More about the white papers will be posted in the future, as completed versions are released or excerpts published. Several of the related slide presentations are online, however, again linked through the conference program. Feedback to the authors via email is invited. Amber Leahey (Scholar’s Geoportal): Amber gave us some of the background on the Scholar’s Geoportal, a GIS data portal/discovery engine run by the Ontario Consortium of University Libraries, and housed at the University of Toronto Library. Their experience with storing and linking to large GIS data sets, and the process of improving the discovery, extraction and data preview aspects of this site can provide our project with significant help in organizing and designing our own pilot Historical GIS data portal over the coming year. Amber’s presentation slides may be viewed at this link. Iain Greensmith and Jonathan Van Dusen (Esri Canada): Esri has been an enthusiastic partner and collaborator in this project, and Iain outlined some of the capabilities of their GIS data portal “sandbox” installation that has been set up for experimentation by collaborators. 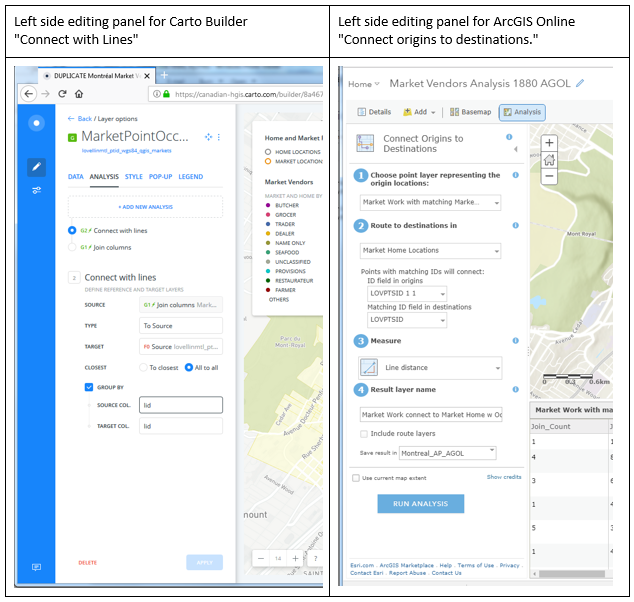 He once again asserted the capabilities of Esri’s portal options to link to data stored remotely, as well as in Esri Online, and make these available to those with or without an Esri license, under certain configurations. He highlighted the customizability of the portal’s front end, and touched on the geovisualization possibilities of their software. These were explored in more detail in an afternoon session by Jonathan, who reviewed Arcgis Online and Story Maps strengths and options for customized web-mapping. Iain’s presentation slides are linked here; Jonathan’s slides are found at this link. Caitlin Blundell (Geoalliance Canada): Caitlin is the director of communications at GeoAlliance Canada. GeoAlliance is built on the foundation of the Canadian Geomatics Community Round Table, and its mandate is to raise the profile and efficacy of the Geomatics sector in Canada in 3 main areas: Sector Identity, Education and Data Access. When asked in the Question Period how Historical GIS could fit into their framework, Caitlin responded with her own question: “Do you think the Historical GIS community would benefit from a national population that had a greater awareness of the value of GIS and geomatics and geography in general?” (audience murmured general agreement…) “If you walked into a historical conference and said ‘I do historical GIS’, and people said oh I know what that is, GIS is neat and really helpful…’ Does that happen now?” GeoAlliance has a “rising tide lifts all boats” type of approach, and are welcoming to all GIS sectors, but we will have to figure out how to work with them to everyone’s advantage. Caitlin’s slide presentation is found at this link. In the afternoon we enjoyed a number of presentations related to HGIS research and teaching. Robert Sweeny outlined his White Paper giving an historical perspective on the evolution of HGIS in Canada, with particular reference to urban HGIS projects like “Montréal l’Avenir du Passé”. Geoffrey Cunfer then outlined what he characterized as “an alternative history of Historical GIS in Canada… another path through environmental history…”, more focused on rural environmental HGIS projects. Interesting contrasts indeed! Following that, Marc St.-Hilaire, Josh MacFadyen, and Don Lafreniere with Dan Trepal spoke about their research and teaching experiences over the last few years. Again, several of these are accessible as slide presentations (and Robert’s as a paper, to which he invites comments) linked through the conference program. Subsequently the session on Historical Geovisualization featured a couple of guest speakers, as well as some drama. We had scheduled Jonathan Marino, from Mapstory.org as a key speaker in this session, since Mapstory.org is a fascinating example of a geovisualization “storytelling” project that appeared well funded and utilized open source mapping tools, and had gained a lot of traction in the U.S. a year ago. In spite of this, the project decided to do a complete re-design of their user interface. This caused an interruption in service of almost a year, and they are just getting re-launched now. If that wasn’t dramatic enough, Jonathan emailed us the day before our conference, and explained that he had just returned from Africa the previous day, and appeared to have a virulent strain of the flu – or perhaps malaria. In any case, he was in no shape to travel. We were very disappointed, and wondered if he might be open to presenting remotely. With some help from the U of T Media Tech staff, in the few minutes before his time slot, we managed to get him online with slides and sound working fine – and so he presented from Washington, D.C. Despite a hacking cough, Jonathan gave us an interesting outline sketch of Mapstory’s genesis as “The atlas of change that everyone can edit”, a place to communally store and share geographical data, and build narratives. It appears that the main reason for their re-boot was the need for more sophisticated group editing tools – the need for Wikipedia-style capability to track changes and curate the data in “consensus” data layers. Jonathan was able to go into some of the details behind this transformation, technical and political, and answer some of our questions. Jonathan’s slide presentation can be accessed here. A different approach to geovisualization online, also unique, is the Neptis Geoweb. (www.neptisgeoweb.org/) The Neptis Foundation (www.neptis.org) is one of our project partners, and Marcy Burchfield, the executive director, reviewed the evolution of this webmapping platform, which was designed to examine urban growth at the regional scale, primarily working in the Greater Toronto Region to day. A sophisticated interface, the Neptis Geoweb does offer customized depictions of regional planning issues (including historical urban development) but is also interested in the integration of VGI or “volunteered geographic information”. They have tried to do this by allowing people to create their own “User stories” – but, similarly to Mapstory, it is here they have run into some challenges. We hope to utilize the experience of Neptis personnel in working through our project’s design of our pilot webmapping site. These ideas were followed-up in the project business meeting the next day, and the collaborators as a group are determined to make sure we take these ideas through to a successful conclusion. We will keep you all informed and continue to get your input as we pursue these goals over the next year! The Canadian Historical GIS Partnership Development mid-term conference coming up this June 20 looks like it will be a landmark day. We have invited a number of folks – some collaborators and some from outside our group – to talk about their own projects, and how these relate to historical GIS data and mapping in Canada. Just as a few examples – Marcy Burchfield from the Neptis foundation (neptis.org) is coming to speak about how their research into urban growth and planning in cities across Canada benefits from incorporating historical land use and development data, and their experience with engaging the public with online mapping. Geoffrey Cunfer is the director of the University of Saskatchewan Historical GIS Laboratory (www.hgis.usask.ca) and will give us some insight into how this successful facility contributes to environmental historical research on the North American plains, as well many other historical GIS-based international studies. Caitlin Blundell is Communications Director for GeoAlliance Canada (geoalliance.ca) and will share what happened at their “Map to the Future” meeting in Calgary last March and discuss how GeoAlliance Canada will support the geomatics and geospatial community in the coming years. What is the place for historical GIS in this broader geo community initiative? And Jonathan Marino is coming from Mapstory.org, to talk about how their project has created “The atlas of change that everyone can edit” – and some of the achievements and challenges along that path. We also expect to have participants, in-house or online, from Statistics Canada, SSHRC, libraries and universities across the country, and (we hope) lots of non-professional history buffs. If you can make it to Toronto, please register and join us in person at the corner of St. George and Bloor (see Conference Program for the address.) And if not, please join us online – login details to come later.